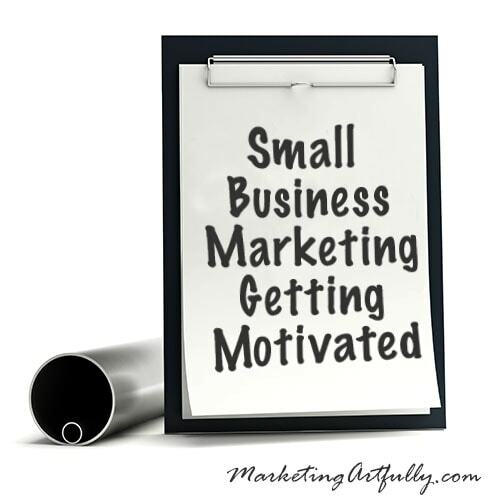 If you could do one thing this year to increase your small business marketing efforts, I would say that getting motivated is at the top of the list! I talk to A LOT of business owners about their small business marketing and the thing I notice most is that they are generally okay with their business. They are not happy or unhappy, they are just okay. They would like more customers and since they are talking to me, I KNOW that they are at least a little bit interested in how to make that happen, but that being said, very few are IN LOVE, head over heels with their business. So how do you fall in love and get motivated again…here are a couple of things to do! Make sure you are SUPER CLEAR about what you are selling and who you are selling to. I have to say that most of the problems that we see with our social media marketing clients is not because they are not seeing results, it is because they don’t even know what the end game is for their efforts. More than one has come to us and said, well we aren’t getting X, to which we reply, hmmmm well we weren’t trying to get X because you told us to try and get Y! Step One…get crystal clear on what your goals are for the next 3 months. I use a three squares worksheet to do this, you can do it with a piece of paper and a pencil. Put down 3 long term goals for your business (5 years out). Then write down 5 things to do in the next three months that would be shorter term tasks that would get you to your goal. Then every day, work on one of those things to the exclusion of all else! Don’t worry when you get them done faster than you ever thought possible, you still have your pencil and can add more tasks if you get finished early. 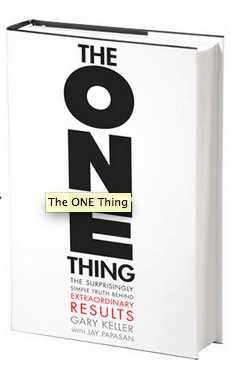 Bonus bit…I have been reading the advanced email copy of Gary Keller and Jay Papasan’s book The One Thing and they have some GLORIOUS ideas in there about focus and how to start habits that will lead to sucess…buy this! So there are lots of quotes about a goal without a plan or a dream without a date…here is the hard truth, if you do not have a step by step plan written down to get things done, you will fail. Life will get in the way and you will be exactly where you are now in 3 months (or three years). I have a weekly meeting with our team to go over what we are shooting for, what we need to get done by the next meeting and make sure we are still on track. These kinds of weekly reviews make sure you are steering along the right course and that everyone is doing what they are supposed to do. I know many small business owners who feel that this kind of meeting and review shouldn’t have to happen, that their employees and partners should be able to work autonomously without any direction. Hmmmm…considering how hard I work to keep ME on track, it is no wonder that our teams need some guidance. Additionally, we have worksheets that allow us to check off boxes when we accomplish things. For the social media for my company, I have a worksheet that lists every day, which social sites to hit, and lo and behold, it gets done. If I were to just say, well I will get to it, I guarantee that there is no way I could do that for a week, let alone every day of the month! Step two…take your crystal clear goals for the next three months and make some forms or worksheets to remind you to do that thing every day. If it is make videos, make a level for each week and just do it. If it writing sales copy and you have research, put down half an hour a day to research and write sales copy. Stretch yourself more than you think because an amazing thing happens, once you get used to doing, it goes faster! I was talking with my bestie this morning about her real estate business and had to step back and look at what makes it so hard to market her! She is using an old fashioned database and my goal for her in the coming year is get her moved over to an internet marketing database like I use! One of the reason that she isn’t as on board is because it is not a real estate database and YEARS of marketing tell her she needs a real estate database….sigh…will let you know when I get her moved over!!! Another thing that came across my desk this week was notice that someone had set up a new website for her financial services business. I though, holy cow, let me see, I bet she is doing really well if she is upgrading like that….sigh…it was a free weebly website and obviously was not going to instill great confidence in people who would be entrusting their life savings to her. SERIOUSLY? A free website? Step three…figure out the tools you need to succeed and start budgeting for them now. My goal for my bestie is to have her on a real database by the end of July! BUT I want her and her assistant to learn about it now so they bust their butts to get the money together to get on board. If you are thinking about using a new technology, talk to trusted resources, get a demo from the company and then make a goal for how to make the money to acquire it!